When I saw the top picture on DrudgeReport.com today, a chill went down my spine. The image of the white van on the sidewalk, mowing down innocent pedestrians was the subject of an animation video I just completed after months of work. 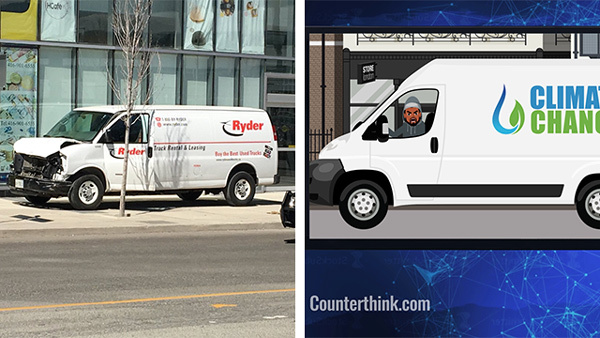 As you see in the feature picture of this story you’re reading right now, the picture on the left is the real van on the sidewalk in Toronto, following the mass murder of innocent pedestrians. The cartoon image on the right is from my “CNN explains van terror attacks” satire video that I was about to release tomorrow, after months of animation, storyboarding and voiceover work with my team.